Since visiting the fabulous ' Secret Garden of Louth' earlier this month we have been inspired to go outside and garden more, plan more, sow more and grow more. It is, as its name would suggest, a hidden garden in the centre of a Lincolnshire market town, presenting a frontage which gives no clue to the riches which lie within. 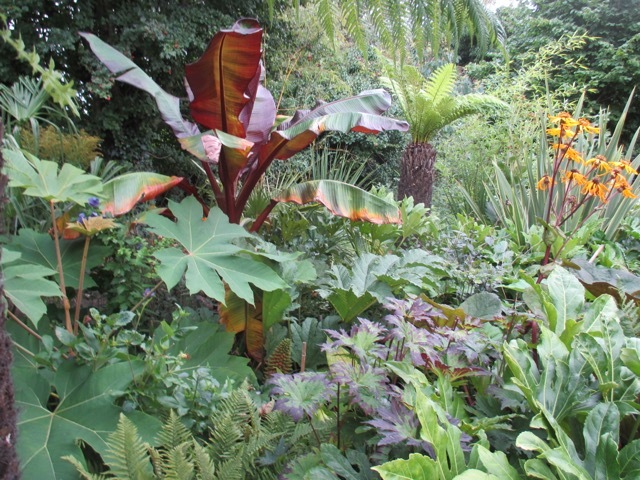 It is a sub tropical garden, bursting with colour and lush foliage with not a straight line in sight. I took no photos on my visit which are worthy of sharing, ( the photos on this post are of our own sub tropical garden), but you can find them on Facebook if you just search 'Secret garden of Louth'. They open for the N.G.S. several times a year in late summer. 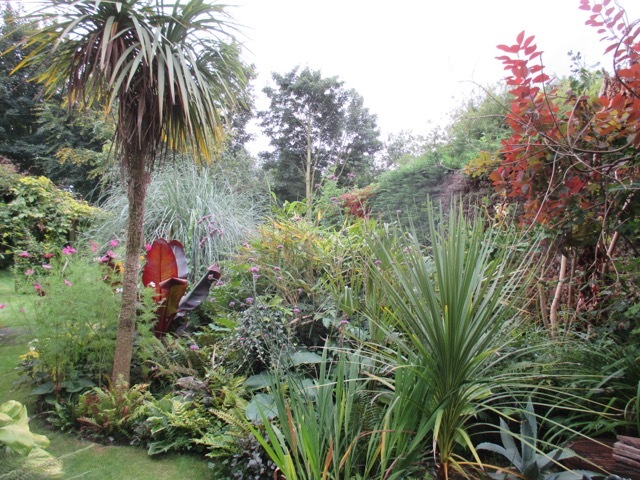 We have had our own sub tropical garden -within-a-garden for many years, but I must admit that I have had little part in planning and maintaining it, as it is my partner who has developed this part of the garden. I am suddenly really enthusiastic about learning more about this type of planting, and also keen to grow as many of the plants as I can myself, in the greenhouse. It is always a pleasure to see how other gardeners tackle this very specific way of gardening, which can break the conventions of traditional gardening . The main period of colour tends to be in late summer and usually comprises of hot, rich colours like oranges, yellows, russets and reds. Foliage tends to be lush and large, using as many hardy plants as possible for the backbone of the garden, with infill of tender stuff and annuals. 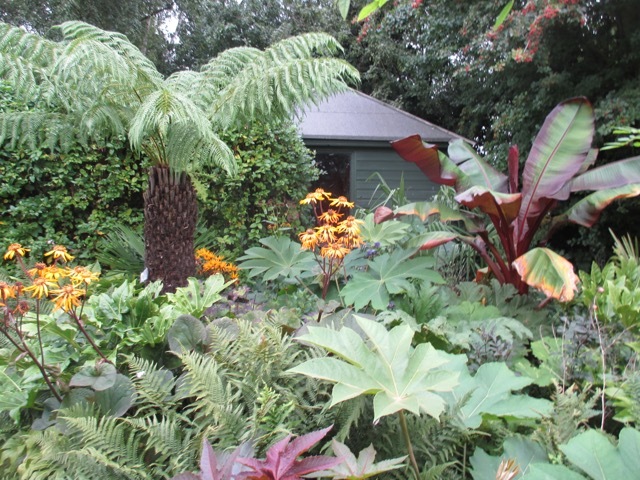 Whereas cottage garden borders are graded in size, with the smallest plants at the front, leading to the largest at the back, sub tropical or exotic planting often sites large plants at the front to heighten the 'jungle' feel. In my opinion the best sub tropical gardens have a feeling of enclosure, with large plants so close to paths that you have to brush by them. There is an area of our garden, affectionately known as the 'Bus shelter bit' for obvious reasons! It has had several reincarnations over the years, but I have never got it quite right, and it has not had a real identity. 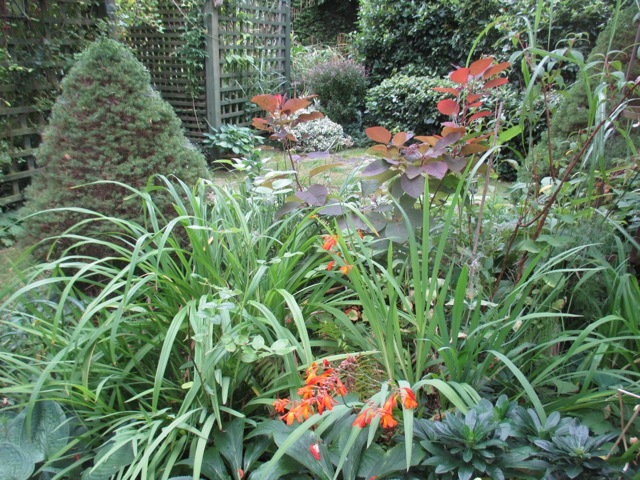 I have tried it as a grasses garden, and a foliage garden and it is currently full of mixed planting. After visiting the 'Secret garden of Louth', and discussing it later, over several glasses of wine, we hit upon the idea of extending our adjacent sub tropical garden into our 'Bus shelter bit'. 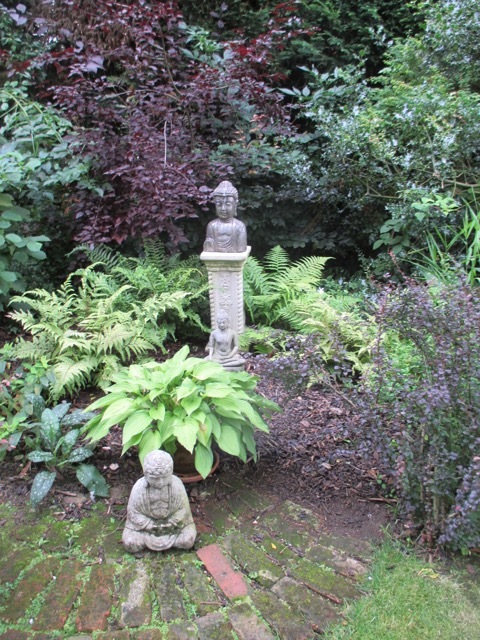 It would lend itself very well, as it has a lot of appropriate planting already - bamboo, cotinus, Fatsia Japonica, Miscanthus, Hemerocallis, heuchera, hostas, Persicaria, Phlox, ferns and hardy fuchsia . The backbone is halfway there, and there are some mature plants already giving height. It is an enclosed space, as it is flanked by two tall boundary hedges, (laurel and conifer,) and divided from the rest of the garden by a climber-covered trellis, and a lonicera hedge and arch. There are some plants which will need to be moved - most worryingly two beautiful English roses "Wisley' and 'St Swithuns', as I don't think they would fit in with the new planting. I have taken lots of cuttings from them over the years, so even if they do not survive, they are cloned elsewhere in the garden. There are also some low growing perennials, such as Phlomis, which will have to be be moved. The cruellest cut of all will be to the four Picea, growing in the central island bed. They have to go as they are far too formal, but I will miss them as they have been there for years and years. 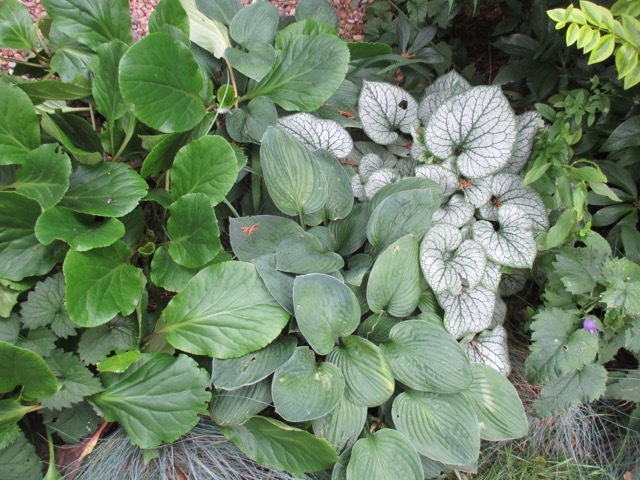 This bit of planting will be staying - Brunnera 'jack Frost', Bergenia and hosta give low, ground cover planting in front of the 'bus shelter' seat. There is only one tree, a Prunus Serrula, which will, of course, be staying, although it will have its canopy raised a little to allow more light in. After all the unwanted plants have been moved to other areas of the garden, then the fun can begin... and most of it will be free ! I have masses of plants to transplant into this new sub-tropical area, such as a huge Miscanthus (which will divide into 4), a huge clump of bamboo (which will also divide into 4 or even 6), giant lillies, hostas and ferns. We plan to invest in two or three big chaps - a tree fern (needs winter protection), Trachycarpus Fortuneii (hardy palm) and perhaps a big Musa Basjoo (hardiest banana - ok to -5 degrees for roots). These should give instant height and impact. 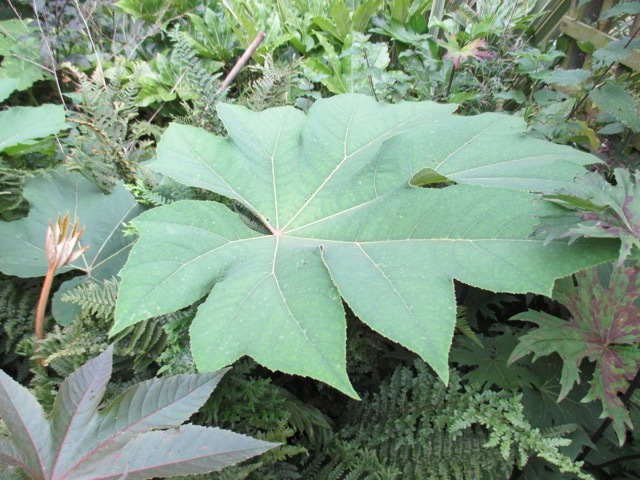 There will be definitely be a Tetrapanax or two, to give a tropical feel. 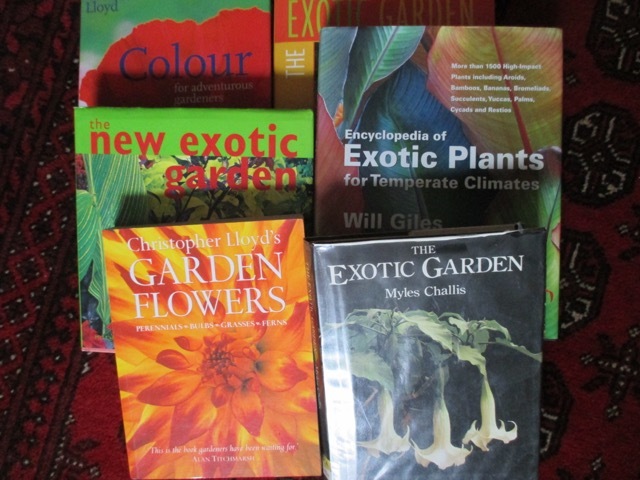 I am picking my partner's brains, and doing my own research into annuals to grow next year for colour and also for height and impact. 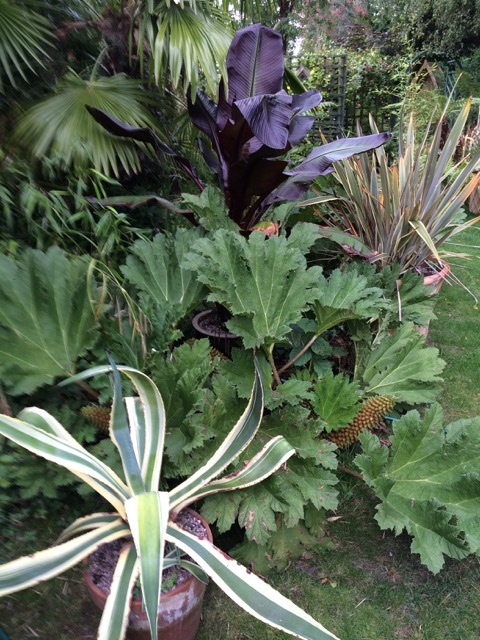 I currently grow Ricinus, Cosmos, Dahlias, Tithonia, Melianthus Major and coleus for the subtropical garden but will be extending this next season to include Inula Magnifica, Angelica Gigas and Amaranths Early Splendour'. 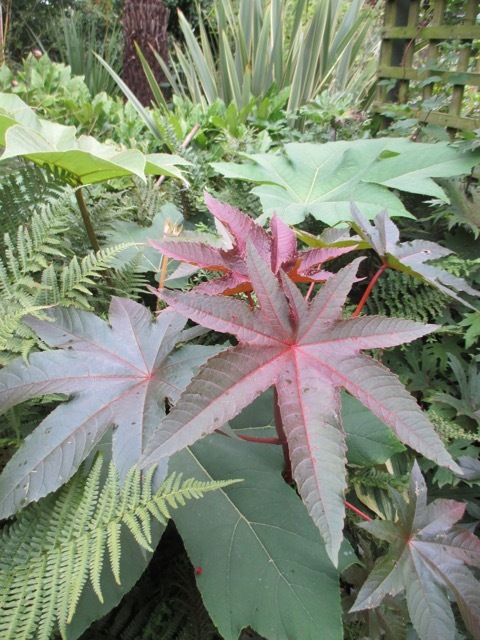 'Jungle Seeds' sell a 'Triffid Mix' which promises fast growing, tall plants in one season and comprises 'Amaranth Lotus Purple (8ft), Hibiscus Manihot (10 ft), Chenopodium Giganteum (8ft), Ricinus Zanzibarensis (15 ft), Ensete Ventricusom (12 ft in 2nd year), Helianthus Kong (12 ft) Solanum Quiotense (6 ft - huge leaves). The photo above shows the Ricinus grown from seed this year. Next year I plan to grow a wider variety of Ricinus, including the massive Zanzibarensis, in another seed collection from 'Jungle Seeds'. An excellent blog I follow is Mark & Gaz's 'Alternative Eden' ( www.alternativeeden.com )', as they also have lots of wisdom to impart. Lovely photos. 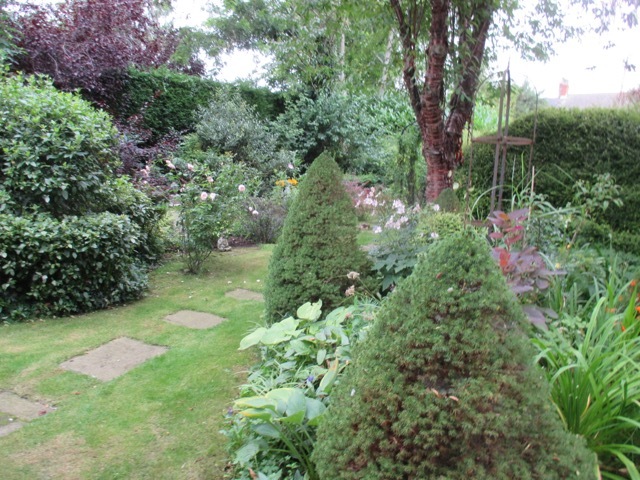 Garden looks fab too! Nothing is more fun than branching out into new areas of gardening. Agreed! It is such a creative process, and so enjoyable when a learning curve is involved! More subtropical inspiration! 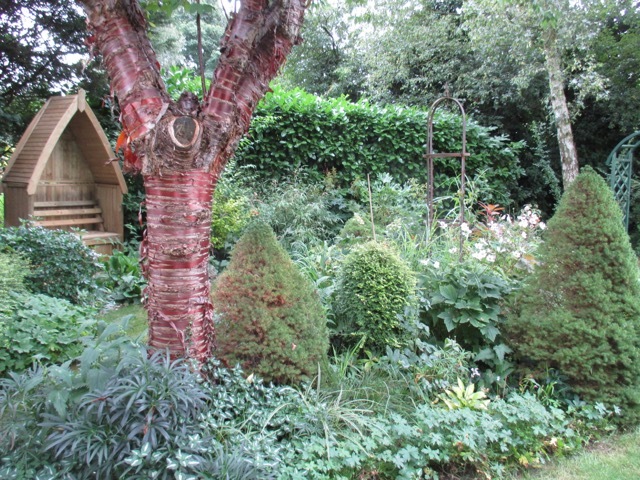 And I do love a cunning plan... and also the Prunus serrula with its fabulous bark. Hi Lyn, how is your sub tropical area coming on ? Prunus Serrula is my favourite tree ever. It has it all ! Don't know why it is not grown more widely here in the UK. The pots are being potted up and moved, but as it's still frosty here right now, a lot will have to wait for a bit longer.I wonder if I have room (and the right conditions) for a Prunus serrula in my garden somewhere? This is the time of year to start and plan, I look forward to seeing the results next year. Hi Brian, it is the only consolation for the end of summer! Log fires, wine and garden plans are the only tempting things about winter! Isn't it astonishing what discussions over several glasses of wine can produce? Oh! I see in your comment to Brian that you're planning on more wine. There might be an expensive winter ahead! Hi Sarah, I'm hoping our 'wine plans' are some of our more sensible ones! I do remember one where I promised faithfully that I would walk the whole of the Pennine Way. Not one of my best decisions as there was NO hope of it ever coming to fruition! It will be amazing, whatever you decide to do. But I have no idea why you call this a 'bus shelter garden'. I've never seen a bus shelter look that fabulous! Hi Tammy, you are too kind ! The first seat we had did look just like a bus shelter, honest! The name just stuck! Hi Francesco and thank you for your comments. Oh what exciting plans Jane which will no doubt will occupy some more research and planning over the next few months and ease the pain of winter. My next but one door neighbour at the allotment has an exotic plot which is looking fabulous at the moment. The foliage and flowers have grown so much that I can no longer see him when is working on his plot. 'Easing the pain of winter' is such a good way of putting it ! Anything which eases that pain is worthwhile ... and I love a good plan!! Thanks Sue, we have already made a start! I really do like the look of that shining tree trunk. It is Prunus Serrula - easy to please, small tree with the most gorgeous bark. How exciting. Your existing exotic garden is fantastic, what fun to extend it. I am looking forward to seeing what you do with the new part. I have been trying to decide whether to create a largely grass area or a lush tropical -garden look like yours, in a large empty space in my orchard. I think I will go with the exotic look, so much more fun. 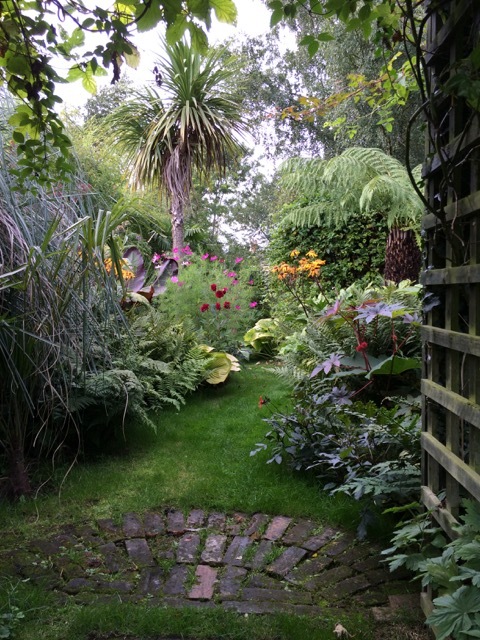 Have you ever been to Will Giles' garden in Norwich? It is amazing. Don't you love it when a plan comes to form? A free plan is even better. Best of luck with this venture. I can't wait to see how it all comes about. You have many exotic, to me, plants in your garden. I love seeing them thriving in a garden.